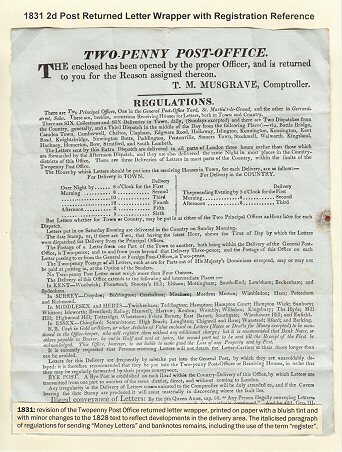 This display is an overview of the ways that people sent valuables through the post before the introduction of a formal Post Office registration service in 1841, covering both the Post Office and private methods. The growing volume of trade and commerce by the late 18th century inevitably meant that items of monetary worth often had to be sent through the mails, and their loss became of increasing concern to the Post Office. 'Money Letters': In 1788 John Harraden, Clerk of the Money Book in the Inland Office, devised a general system for the registration of property letters. He proposed that an office in London should be set up to accept letters for registration on payment of a fee; they would be advised separately on letter-bills, enabling their progress to be traced. Although his plan was not fully implemented, a truncated version of its ideas came into operation in 1792. From 22nd September 1792 the public were encouraged to hand their "Money Letters" to the window clerk or postmaster. The addresses were written on the letter-bills, the letters wrapped in the bill for onward despatch, and a signature taken on delivery. In effect, they were given de facto registration at no additional charge (but as they contained enclosures by definition, they were liable to at least a double rate). This was "a mere rule of the Office" in order to reduce losses from the post -- it only applied to items of intrinsic value such as coins and jewellery (whose shape and weight made them readily detectable when enclosed in a letter), and no liability for losses was admitted. It was finally abandoned on 10th January 1840 upon the commencement of the Uniform Penny Post, due to fears that it would be impossible to handle an increased number of Money Letters. Banknotes: The turn of the 19th century was the heyday of private banking in Britain, and notes and bills in letters became a convenient way to transfer funds. They were especially useful if money had to be sent over long distances, or in large amounts. The "Money Letter" system did not cover letters containig only "valuable Paper", which were not easily distinguishable inside a letter. The officially recommended method for mailing notes was to cut them in two and send each half by a separate post - an expensive procedure. As a result of this advice, the designs of banknotes were altered from 1792 to include the serial number at both ends. Request to Pay Money Sent 'Per Dairymaid'!